Ballina Lions Club will present a screening of Black 47, Lance Daly’s film about the Irish Famine, in Ballina Arts Centre on Tuesday October 9. The screening is a fundraiser for a Famine exhibition, which will open on Saturday 20th October at Ballina Civic Offices, and any surplus funds raised on the night will go towards relieving homelessness in Mayo and general Lions’ charities. Kicking off at 7.30pm, the screening will be preceded by a wine and cheese reception. 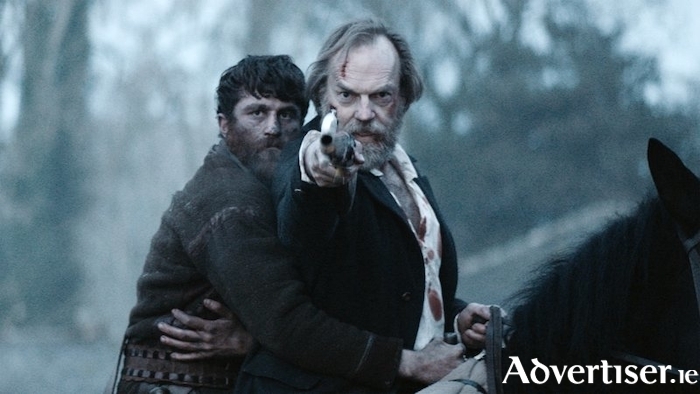 Set in 1847, Black 47 stars Hugo Weaving, Jim Broadbent, James Frecheville, Freddie Fox and Irish actors Stephen Rea, Moe Dunford, Sarah Greene and Barry Keoghan. The film follows the exploits of Feeney (Frecheville ), an Irish soldier who has abandoned his post with the British Army to return to his west of Ireland home, only to find his mother starved to death, his brother hanged, and his sister-in-law and her children starving. As he sets out for revenge, a violent British soldier (Weaving ) is sent to track him down. Mixing history with the tropes of Westerns and revenge thrillers, in Black 47 Daly has created a significant and long overdue addition to Irish history on screen. Given the many films which have taken their inspiration from Ireland’s troubled history, the lack of those that depict the events of the Great Famine is all the more noticeable, and so credit is due to director Lance Daly (who also directed Kisses ) for tackling such a tragic subject.